THERE is a river in northern France which a certain German army corps will never forget. Every bridge had been blown up and the French had made a strong resistance from the south bank for two days. German intelligence discovered a weak spot in the defense, however, and here they determined to cross at night. Soon after dark Boche engineers began their work. Huge guns came out of concealment and were hurried to the riverside. The bridges, which were being built six at once, seemed to fairly leap across and as quickly as they were completed the troops started to march over them. It was then that things began to happen. 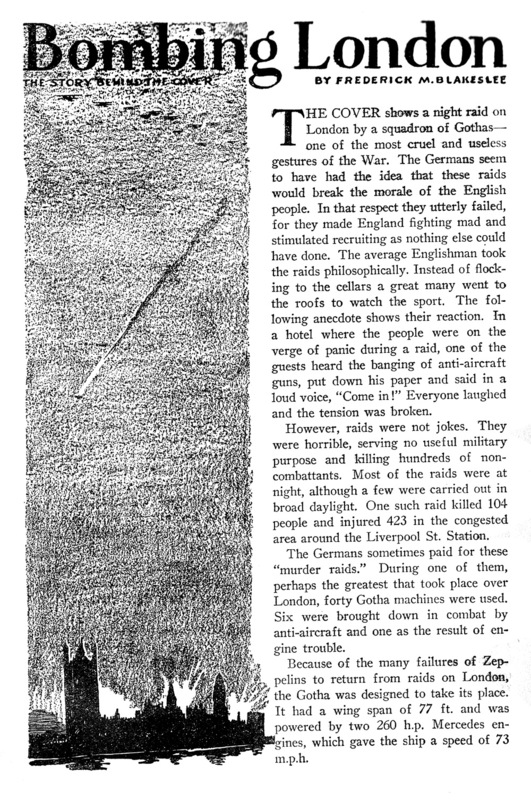 The Germans became conscious of a pulsation which quickly became a rumble, then a roar, as two squadrons of fighting Scouts swept down upon them, spraying the bridges with lead and dropping small bombs. The Jerries broke and ran in both directions. 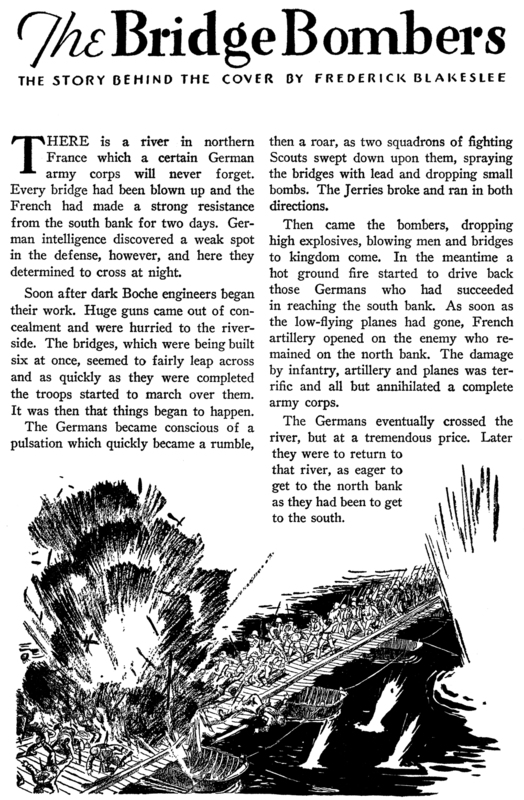 Then came the bombers, dropping high explosives, blowing men and bridges to kingdom come. In the meantime a hot ground fire started to drive back those Germans who had succeeded in reaching the south bank. As soon as the low-flying planes had gone, French artillery opened on the enemy who remained on the north bank. The damage by infantry, artillery and planes was terrific and all but annihilated a complete army corps. The Germans eventually crossed the river, but at a tremendous price. Later they were to return to that river, as eager to get to the north bank as they had been to get to the south. 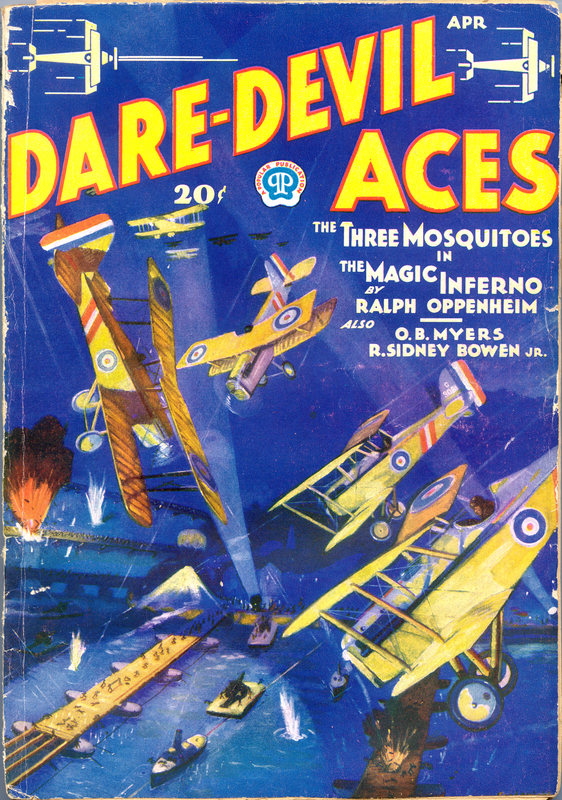 THE COVER shows a night raid on London by a squadron of Gothas—one of the most cruel and useless gestures of the War. The Germans seem to have had the idea that these raids would break the morale of the English people. In that respect they utterly failed, for they made England fighting mad and stimulated recruiting as nothing else could have done. The average Englishman took the raids philosophically. Instead of flocking to the cellars a great many went to the roofs to watch the sport. The following anecdote shows their reaction. In a hotel where the people were on the verge of panic during a raid, one of the guests heard the banging of anti-aircraft guns, put down his paper and said in a loud voice, “Come in!” Everyone laughed and the tension was broken. However, raids were not jokes. They were horrible, serving no useful military purpose and killing hundreds of non-combattants. 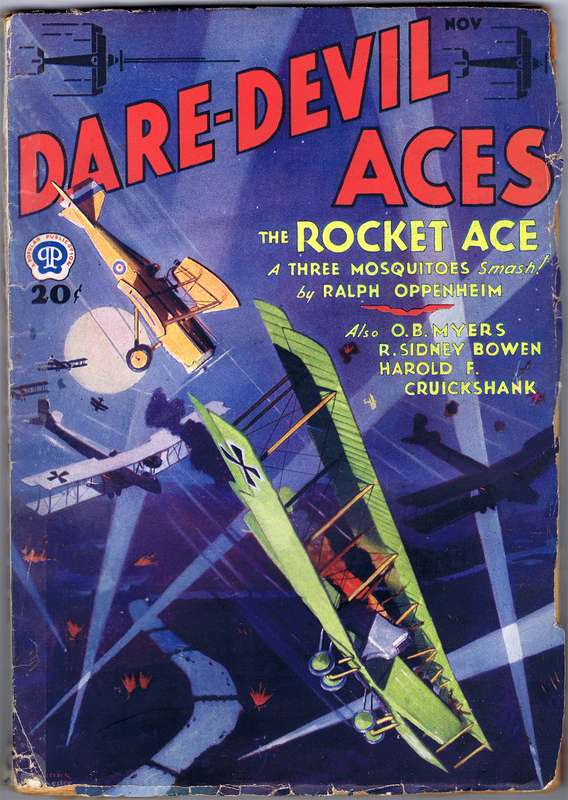 Most of the raids were at night, although a few were carried out in broad daylight. One such raid killed 104 people and injured 423 in the congested area around the Liverpool St. Station. The Germans sometimes paid for these “murder raids.” During one of them, perhaps the greatest that took place over London, forty Gotha machines were used. Six were brought down in combat by anti-aircraft and one as the result of engine trouble. Because of the many failures of Zeppelins to return from raids on London, the Gotha was designed to take its place. It had a wing span of 77 ft. and was powered by two 260 h.p. Mercedes engines, which gave the ship a speed of 73 m.p.h.